In 1998, IBM was the biggest American tech company by revenue. 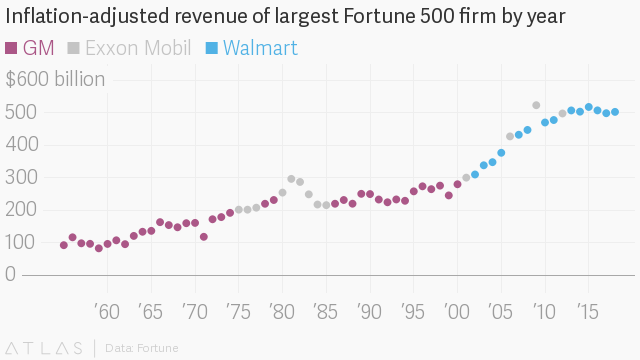 Now, some 20 years later, it’s not even among the top 30 companies in the Fortune 500. Today, Fortune released its annual Fortune 500, a list of the 500 largest American companies by sales. 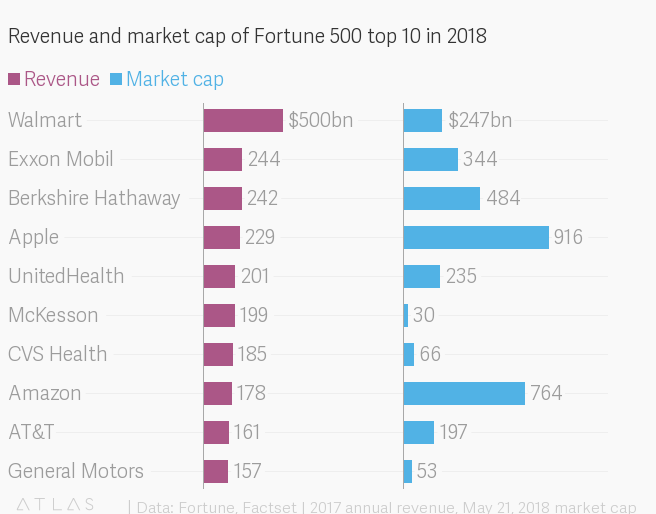 Together, the Fortune 500 firms represent more than $1 trillion in profits, $21 trillion in market value, and employ some 28 million people around the world. The list is topped by the usual suspects: Walmart, Exxon Mobil, Berkshire Hathaway, Apple, and Amazon. The list is as much a testament to the rise and fall of certain industries as it is to America’s biggest corporations. In 1998, the tech behemoths we take for granted today, like Amazon and Apple, hadn’t even landed on Fortune’s list. Even in 2008, Apple still ranked beyond the top 100, while Amazon had yet to score a spot. In 2017, however, these two tech behemoths brought in more than $400 billion in revenue. The opposite, of course, happened to banks. In 2008, three banks were in the top 20 Fortune 500 companies, with two, Citigroup and Bank of America, among the top 10. Now, just one bank, JP Morgan, has (barely) edged into the top 20. If it feels like there’s more turnover in the Fortune 500, that’s because there is. Two researchers found that the “half-life” of Fortune 500 members—how long they’re likely to stay a Fortune 500 company once making the list—has shortened considerably in recent decades. Today, Exxon and General Motors still remain in the top 10, bringing in more than $400 billion in combined revenue. In terms of the companies that investors are most excited about, though, Apple and Amazon are worth far more in market capitalization than Walmart, Exxon, GM, and others that rank high on the Fortune lists. These heady valuations suggest that rankings based purely on financial measures like revenue and profit may not reflect what people value the most as the economy evolves.